Table-topping Chelsea and their title rivals Tottenham both have four players in the PFA Premier League Team of the Year. Chelsea midfielders N’Golo Kante and Eden Hazard, both nominated for the PFA Player of the Year award, are included, while Blues central defenders Gary Cahill and David Luiz are also in the line-up. Spurs, who trail Chelsea by four points in the title race, are represented by midfielder Dele Alli and striker Harry Kane, as well as full-backs Danny Rose and Kyle Walker. Manchester United’s David De Gea gets the nod in goal, while Liverpool winger Sadio Mane and Everton striker Romelu Lukaku, the division’s top scorer with 24 goals, complete the line-up. 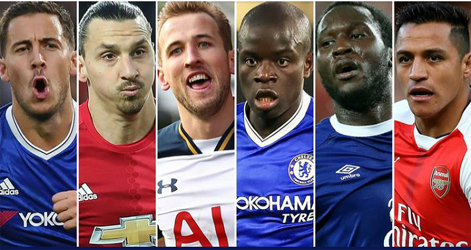 While Kane and Lukaku are also on the shortlist for player of the year, the other two nominees, United’s Zlatan Ibrahimovic and Alexis Sanchez of Arsenal, miss out. Anthony Knockaert is one of four Brighton players in the Championship Team of the Year. The French midfielder, the Championship’s Player of the Year, is joined by goalkeeper David Stockdale and defenders Bruno and Lewis Dunk for the Seagulls, who celebrated promotion on Monday. Newcastle trio Jonjo Shelvey, Jamaal Lascelles and Dwight Gayle are included, along with Leeds striker Chris Wood, Aaron Mooy of Huddersfield and Fulham duo Tom Cairney and 16-year-old full-back Ryan Sessegnon. The post Table-topping Chelsea, Spurs stars headline PFA Team of the Year appeared first on Vanguard News.